Did you know the concept of snow cones has been around since the mid 1850’s? Once ice became commercially available – they were commonplace, everywhere from theaters to baseball games. Samuel Bert, the inventor of the snow cone machine, went on to sell millions of the icy treats at the State Fair of T exas in the early 1900’s. 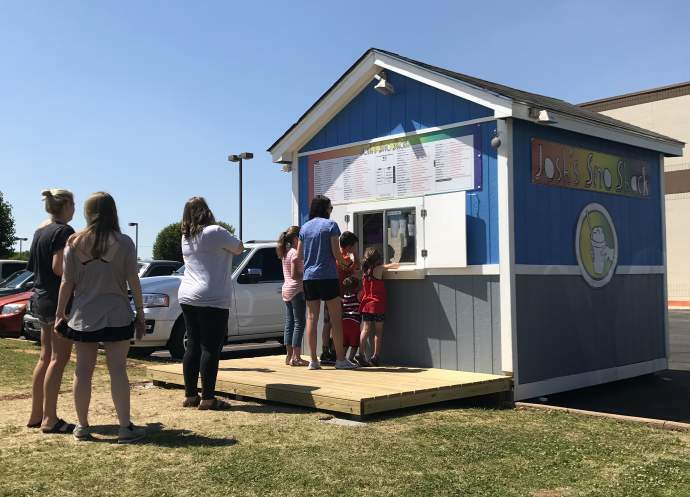 Snow cones certainly haven’t lost their popularity, especially in Stillwater during a triple-digit heat wave. They have become a hot weather staple for kiddos and adults alike and we’re confident these tricked-out-chilly-treats will become your favorite summer splurges. 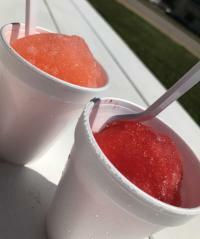 With favorites such as Dragon Slayer and the “secret phenomenon” of Josh’s Mix, you can’t go wrong at Josh’s Sno Shack. Owned by OSU Accounting and Entrepreneurship sophomore Austin Anderson, the Sno Shack has already become a mainstay in Stillwater due, in part, to the popularity of the franchise in Tulsa, OK. Austin worked for the man himself, Josh Juarez, for three years in high school and is now slinging his own sno cones in the Food Pyramid parking lot. His mission is to “create positive summer memories for the people of Stillwater” and we think he is doing just that. 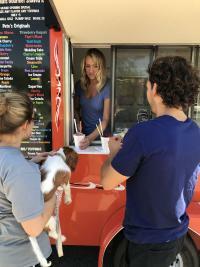 Austin prides himself on offering the softest ice and cheapest price for those who need a sweet summer treat. Regardless of the flavor, be sure to get our team’s favorite topping – pop rocks! We recommend a side of creativity with your snow cone and it’s easy to get those sweet juices flowing at Pete’s Treats Gourmet Shaved Ice located at 601 W 6th Avenue. With over 20 toppings and 40 flavor combinations, the possibilities are endless. One of our favorites is the Strawberry Cheesecake shaved ice with cheesecake bites and whipped cream topping. Pete’s Treats is locally owned and operated - Kevin Gum, Pete’s Treats owner, has owned businesses in Stillwater for over 28 years and is a big proponent of buy, shop, and stay local. So whether you want something simple, like the classic Bubblegum, or have a hankering for something more extravagant, Pete’s Treats won’t disappoint. While you’re there, check out the big screen TV’s, free Wi-Fi, and air-conditioned building! Three words. Rocky Road Parfait. Picture it – three layers of homemade chocolate ice cream, marshmallow Italian ice, and Oreo crumbles, drizzled with caramel, and topped with whipped cream and more Oreo crumbles, for good measure of course. Nothing quite compares to the delectable tastes served up by the Sweet Treats Truck team during the summer months. Word on the street is an Italian soda fountain will be installed on the truck with the possibility to concoct over 60 combinations of sodas. The Sweet Treats Truck can be found at various Stillwater locations (their schedule is posted at purdyq.com and on Facebook weekly at PurdyQ Meats & Treats). Don’t miss Dan Purdy and his sweet-treat-serving team on Saturdays at the Stillwater Farmer’s Market and most Friday Food Trucks and Tunes in Downtown Stillwater. 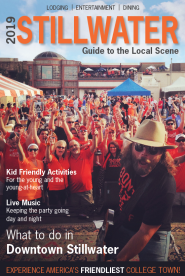 We have the exclusive inside scoop, pun intended, to the monthly shake at Eskimo Joe’s for June! 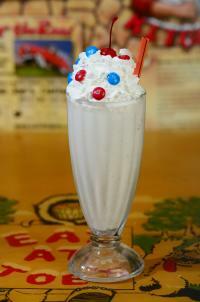 The Patriot Shake blends Breyer’s vanilla bean ice cream with red, white, and blue M&M’s®, topped with whipped cream, and a cherry. Named for the Folds of Honor, an organization that provides scholarships to spouses and children of fallen and disabled service-members, this patriotic treat is the kick-off to Eskimo Joe’s fundraising event that will help both those in need and your sweet tooth! 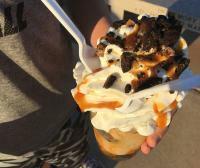 While these locations are certain to satisfy your taste buds, if you are still looking for more – Cowboy Corner, Trailer Trash Treatz, or the monthly Monster Shake at MoJo’s Rock ‘n’ Bowl Grill will indulge even the most connoisseur of tasty treat lovers.